Drones and wearable technology have both become hot topics in tech news, so it should come as no surprise that someone has figured out a way to combine the two. Nixie is a device that wraps around your wrist like a bracelet, but when you want to take a picture it untethers from you, flies into the air, snaps a photo, and then returns to you. 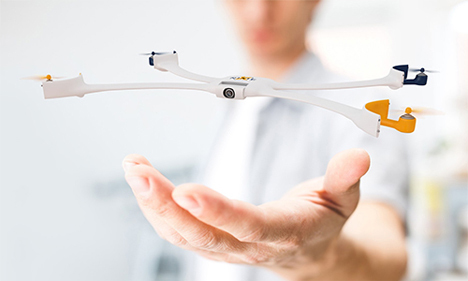 Nixie is being developed as part of Intel’s Make It Wearable Challenge. The challenge is a global call for ideas that will seamlessly integrate personal technology into our everyday lives. 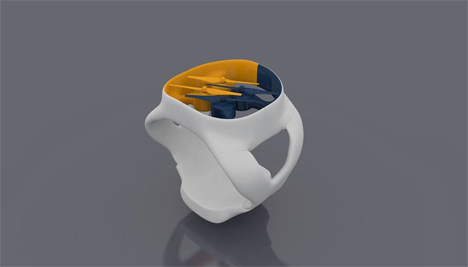 Nixie, the tiny wearable quadcopter with a camera, is one of the finalists in the challenge. According to the team members, Nixie is there to capture the memories you always wish you’d had photos of but could never quite capture before. When you set the quadcopter free from your wrist, it senses your location, flies a short distance away, and captures a photo from an angle that otherwise wouldn’t have been attainable unless you had a camera crew following you around. 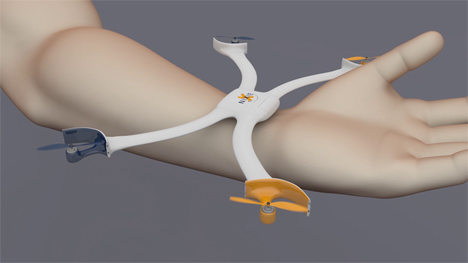 Because the product is still in the development stages, there isn’t much information available about how far it will fly, how long the battery will stay charged, or how much it will cost. But Team Nixie is confident that the product will make it to the market, and it seems a very attainable goal. With the proliferation of selfies – particularly those taken during sports and other adventures – there is definitely a market for a personal drone that can be your own personal action photographer. See more in Camera & Video or under Gadgets. October, 2014.